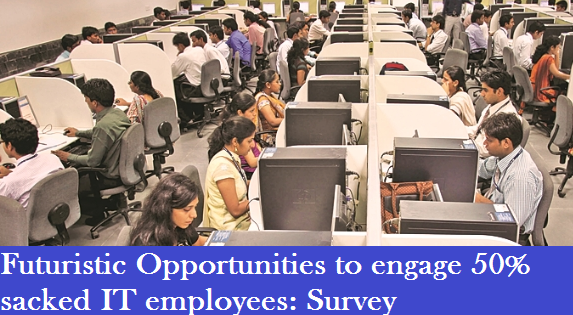 Futuristic Opportunities to absorb 50% sacked IT employees: Survey. The survey was conducted by CIEL HR Services among mid to senior-level professionals in 50 IT companies. "This may sound depressing, but all is not lost. There are enough opportunities to be leveraged upon," CIEL HR Services CEO Aditya Narayan Mishra told PTI quoting the survey. CIEL HR Services was conducted a survey among mid to senior-level professionals in 50 IT companies said that "Nearly two lakh jobs expected to be slashed in the IT sector in the next two years, all is not lost as more than 50 per cent of the laid off employees will be re-skilled and transferred to other opportunities,"
"The normal industry attrition is 15-20 per cent, which is not getting replaced and with automation taking over, more than two lakh jobs are likely to be lost in next two years. "This may sound depressing, but all is not lost. There are enough opportunities to be leveraged upon," CIEL HR Services CEO Aditya Narayan Mishra told PTI quoting the survey. Most of the layoffs are taking place in segments like IT infrastructure support, testing and software development, Mishra added. However, new opportunities are emerging in areas such as cloud computing and artificial intelligence, among others, he added. "The transition is already taking place. About 50 per cent of the laid off workforce in the industry, including freshers with under eight years of experience, will be re- skilled and transferred to other opportunities," the survey said. While the remaining 50 per cent might find it difficult, they can find alternate career opportunities in other sectors, including retail and consumer banking, it added. New platforms which are helping IT companies to create and deploy applications that are faster and simpler are making many jobs redundant. Automated tools like bots and a range of automation platforms are also reducing human efforts. According to the survey, socio-political changes around the world are also putting pressures on governments in the West to review their policies of outsourcing. Immigration policies are being re-looked, hence companies in India have to find other ways of generating demand and continue climbing the value chain, it said. According to the survey, only 33 per cent of the respondents anticipated factors like automation and changing government policies resulting in job losses, while 44 per cent said firms will shed weak performers in this process. Similarly, 44 per cent said the change has come faster than expected. However, 56 per cent believe that the layoffs are being discussed a lot, which is causing panic. New opportunities to absorb 50% sacked IT employees: Survey. The survey was conducted by CIEL HR Services among mid to senior-level professionals in 50 IT companies. "This may sound depressing, but all is not lost. There are enough opportunities to be leveraged upon," CIEL HR Services CEO Aditya Narayan Mishra told PTI quoting the survey.